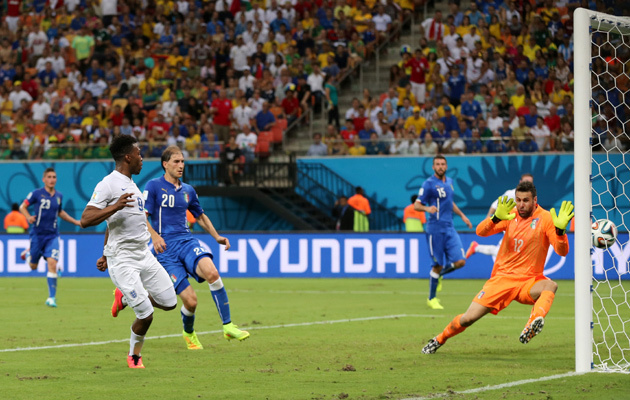 Pirlo v Gerrard…Sturridge v Balotelli…who comes out on top? How do you support your country In Brazil but remain implacably opposed to the World Cup? We’re underway in rainy Recife for the fourth game of the day. At 22:00 local time, this is the latest kick-off time of the tournament. 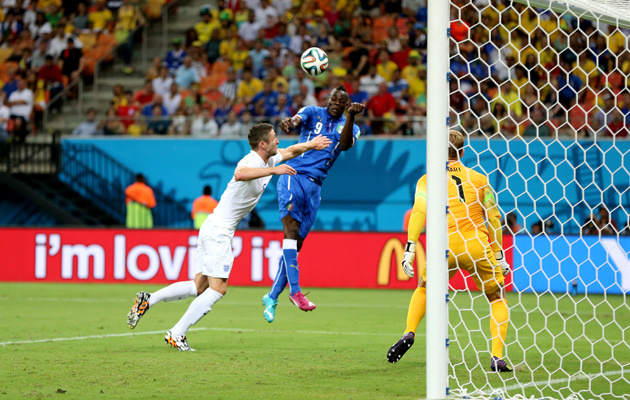 Andrea Pirlo’s free-kick form the edge of the area completely bamboozles Joe Hart and cannons back off the crossbar. Baines find the unmarked Rooney 15 yards out but the striker screws his shot inches wide. Italy regain the lead through Mario Balotelli. Not for the first time, Candreva beats Leighton Baines to supply a cross from the right which the striker buries the header past Hart. Mario Balotelli does well to beat Joe Hart to a loose ball, and he then chips the retreating keeper, but Phil Jagielka is on hand to head off the goalline. From the resulting corner, the ball is not cleared and Antonio Candreva screws in a near post shot which beats Hart but comes back off the post. That’s the last action of an eventful first half. Immediate response from England. Sterling sets Rooney free on the left and he floats an inviting cross into the path of Sturridge, who sweeps the ball in from close range on the half volley. It’s a well worked corner from Italy and the ball is rolled to Pirlo who lets it run through his legs for Marchisio, and the midfielder has time to pick his spot and lash in a shot from the edge of the penalty area. Glen Johnson sends Danny Welbeck through on the right and the forward does well to get to the byline, before supplying a dangerous cross which Andrea Barzagli slices away for a corner with Daniel Sturridge lurking. We’re underway in Manaus for the 3rd game of the day. The teams have been announced and England coach Roy Hodgson has sprung something of a surprise by including Raheem Sterling in his starting line-up in place of Adam Lallana. As expected, Gigi Buffon is out for Italy as Andrea Pirlo takes the captain’s armband. To compound their woes, Uruguay have pitbull-like enforcer, Maxi Pereira, sent off after he takes a wild swing at Campbell near the corner flag. That momentary lapse of control will rule him out of Uruguay’s next game against England. Campbell is the provider, sliding a beautifully weighted pass through to substitute Marcus Urena, who has burst beyond the Uruguayan defence and calmly slots the ball past the onrushing Muslera. Costa Rica have threatened before from set-pieces and this time they punish some slack marking by the Uruguayan rearguard. It’s a teasing delivery, as Duarte peels off the last man and launches himself into a diving header which evades Fernando Muslera and nestles into the far corner. Luis Suarez is warming up on the touchline. How long before we see him on the pitch? How fit is the Liverpool striker? He’s been Costa Rica’s and arguably the game’s best player – certainly its most inventive. Joel Campbell rifles home with an unstoppable left shot after great work by Cristian Gamboa. The ball comes to Diego Forlan on the left hand side of the penalty area, and the veteran takes a swing at it and his deflected shot loops towards the far corner, but Costa Rica goalkeeper Keylor Navas makes an acrobatic save to tip over. 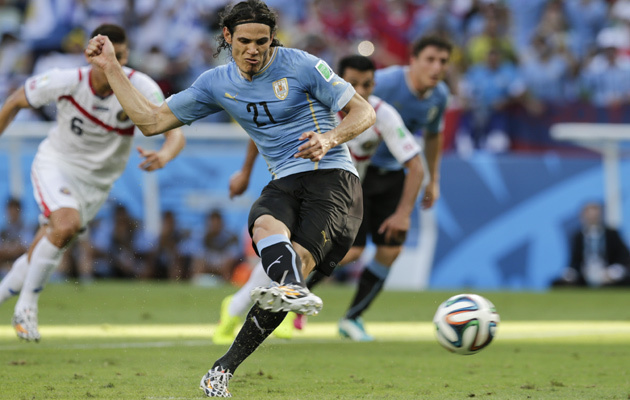 Edinson Cavani opens the scoring for Uruguay from the penalty spot. Cavani dispatches the resulting penalty and the favourites are ahead. Uruguay awarded a penalty. There is confusion over the award of the penalty with Costa Rica surrounding the referee claiming that Uruguay’s Diego Lugano has handled, but replays show that the defender was being hauled to he floor as the cross came in. Uruguay have the ball in the back of the Costa Rican net, but Diego Godin has strayed offside. Moments later there’s a glorious opportunity for the unmarked Edinson Cavani after a free-kick is sliced into his path, but the PSG striker flashes his volley wide. The second match of the day, and the first in Group D is underway in Fortaleza. Uruguay, even without injured striker Luis Suarez, will be expected to overcome a limited Costa Rica side. The football world is still digesting the implications of Holland’s remarkable 5-1 demolition of world champions Spain. World Soccer editor Gavin Hamilton has paid tribute to the flexibility of Dutch coach Louis Van Gaal, and identified the tactical changes that made the win possible. 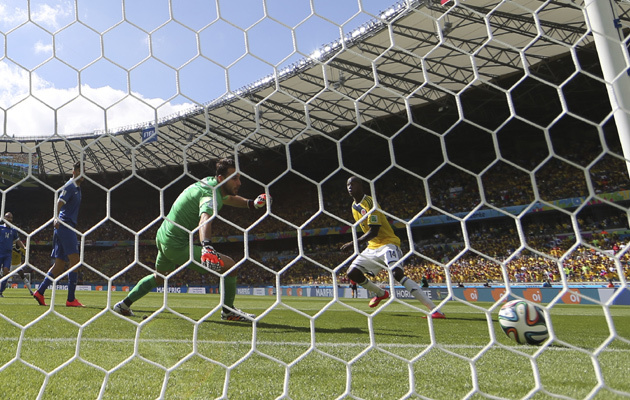 Colombia 3-0 Greece – what have we learned? A comfortable win for Colombia against a disappointing Greek side. For all the match details, plus our thoughts on the game, click here. Juan Cuadrado, the game’s outstanding performer, embarks upon another penetrative run, after a quick free kick before the ball reaches James Rodriguez via backheel, and he guides a low shot ast the keeper. It is hard to see a way back, especially if they pass up opportunities like the one squandered by Theofanis Gekas. Shocking miss by the striker who heads on to the underside of the crossbar from two yards out, before Colombia clear off the line. Miss of the tournament by Gekas who is forced to perform the walk of shame as he is immediately replaced by Kostas Mitroglou. Hard to see a way back from Greece now. Abel Aguilar flicks on a low James Rodriguez cross into the box for Teofilo Gutierrez, who is standing unmarked at the far post and cannot miss. Colombia take an early lead against Greece. Let’s be honest, it’s not a classic encounter in Belo Horizonte, but both teams have had their chances. Colombia have shaded it and just about deserved the lead but Greece’s Panagiotis Kone drew a great save from David Ospina to remind the South American side that this is not a foregone conclusion. Colombia’s Juan Cuadrado jinks his way past a defender on the right and supplies a low ball into the area for Pablo Armero, whose shot is diverted via a Greek defender inside the post. We’re underway in Belo Horizonte. Although the tournament has passed off relatively peacefully so far, security and police officials in Rio de Janeiro have warned members of the press about the way they cover the demonstrations against the World Cup. Group C kicks off this afternoon with Colombia meeting Greece in Belo Horizonte. Colombia are without star striker Radamel Falcao who failed to recover from injury in time for the tournament. In his absence, coach Jose Pekerman has a number of decisions to make. Read our thoughts on his tactical options. The 5-1 hammering by Holland was a painful defeat for Spain, particularly for Iker Casillas who endured a forgettable night in Salvador. To his credit, the Real Madrid keeper did not hide afterwards, speaking candidly about his own performance – one which could signal the end of an illustrious international career. Since the emergence on the international stage of the likes of Adam Lallana, Raheem Sterling and Daniel Sturridge, much (probably too much) has been made of England’s pacey options up front. Italy coach, Cesare Prandelli, whose side face England in Manaus tonight, has been speaking of the game-changing potential posed by Roy Hodgson’s attacking quartet. In midfield, it’s a similar story, with Liverpool’s Steven Gerrard enjoying a stellar season with Liverpool , while for Italy, Juventus’ Andre Pirlo was equally effective, though perhaps less eye catching. Gerrard edges it domestically, but on the international stage, not least two years ago in Kiev, when Pirlo gave his English adversary an object lesson in controlled midfield play, the Italian is is the dominant force. Midfield generals…both Steven Gerrard and Andrea Pirlo will look to pull the strings. Italy face England tonight in one of the more eagerly awaited group matches. Both teams are expected to go with a lone striker this evening. For England, Liverpool’s Daniel Sturridge will lead the line, while Italy will rely on the mercurial talents of Milan’s Mario Balotelli. Both carry a goal threat, but as you can see from this helpful graphic supplied by whoscored.com, looking at the 2013-14 season, it is Sturridge who appears to carry the greater threat. 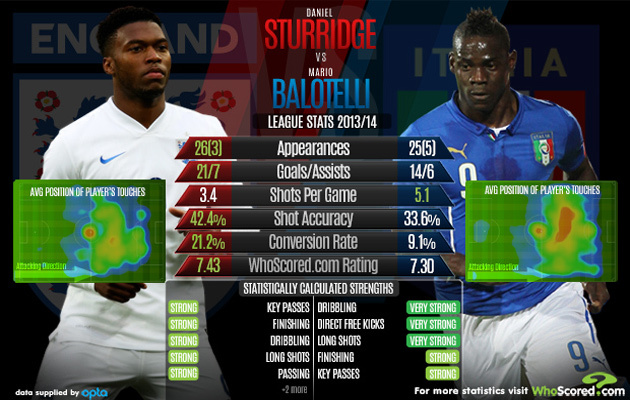 Striking options…Daniel Sturridge and Mario Balotelli are both potential match winners. World Soccer editor Gavin Hamilton is in Brazil for the next month. He’ll be writing regular bLogs on his experiences at the World Cup, watching the action on the pitch and monitoring the mood off it. Today, he looks at the hosts opening day victory over Croatia, and notes how many in Brazil are trying to reconcile their support for the home nation whilst maintaining their opposition to the tournament itself.